The Turbulent World of Middle East Soccer: Saudi moderation: How far will Crown Prince Mohammed go? In his effort to improve Saudi Arabia’s badly tarnished image and project the kingdom as embracing an unidentified form of moderate Islam, Saudi Crown Prince Mohammed bin Salman has hinted that he envisions a conservative rather than an ultra-conservative society, but not one in which citizens are fully free to make personal, let alone political choices of their own. Prince Mohammed’s vision, although not spelled out in great detail, seemed evident in an interview with CBS News’ 60 minutes, his first with a Western television program, on the eve of a three-week trip that is taking him across the United States. The trip is designed to cement relations with the Trump administration following the dismissal of Secretary of State Rex Tillerson, who Prince Mohammed and his United Arab Emirates counterpart, Mohammed bin Zayed, viewed as unenthusiastic about their hegemonic designs for a swath of land stretching across the Middle East from the Horn of Africa to South Asia, including the Saudi-UAE-led ten-month old diplomatic and economic boycott of Qatar. The visit comes barely a month before Mr. Trump has to decide whether to pull the United States out of the 2015 international agreement with Iran designed to curb the Islamic republic’s nuclear program. A withdrawal could lead to the agreement’s collapse and spark a nuclear arms race in the Middle East. “Saudi Arabia does not want to acquire any nuclear bomb, but without a doubt, if Iran developed a nuclear bomb, we will follow suit as soon as possible,” Prince Mohammed, who is locked into existential battle with Iran, told CBS. It is also intended to project the kingdom as a beacon of moderation rather than a promoter of ultra-conservatism and cutting-edge modernity led by a young reformist but autocratic king-in-waiting. In a meeting in the White House with Donald J, Trump, on the first day of his visit, both Prince Mohammed and the US president touted the economic benefits of the two countries’ relationship, with massive US arms sales and other deals, including nuclear sales that would involve reducing US safeguards by giving the kingdom the right to enrich uranium. Both leaders asserted that the deals would significantly boost employment in both Saudi Arabia and the United States. Besides Mr. Trump, Prince Mohammed is scheduled to meet members of Congress, think tanks and academics, oil executives, businessmen and representatives of Silicon Valley’s high-tech industry and Hollywood. Both Prince Mohammed and Mr. Trump need to demonstrate economic progress to boost or cement their popularity at home. The crown prince needs to demonstrate to Saudis that he is feted as a leader despite mounting international criticism of his conduct of the ill-fated, three-year old war in Yemen, his domestic power and asset grab under the mum of an anti-corruption campaign, the kingdom’s long-standing severe political and social restrictions, and its four-decade long global support for ultra-conservative Sunni Islam. Beyond concern about the high civilian casualty rate in Yemen and the war having sparked one of the world’s worst current humanitarian crises, many fear that potentially destabilizing anti-Saudi sentiment in the ravaged country will persist long after the guns fall silent. Those fears are reinforced by contradictory Saudi measures. While on the one hand pledging billions of dollars in aid and allowing at least some relief to get into the country, Saudi Arabia has aggravated the crisis in the country by expelling tens of thousands of Yemeni workers in recent months. Prince Mohammed also needs to demonstrate that he can attract foreign investment despite the arbitrary nature of the arrest in November of hundreds of senior members of the ruling Al Saud family, prominent businessmen, and high-ranking officials, and reports that at least some of them were abused and tortured during their detention. Most of the detainees were released after surrendering control of assets and/or paying substantial amounts of money. The government said it expects to raise $100 billion from the asset grab. Prince Alwaleed bin Talal, one of the most prominent detainees and the kingdom’s most-high-profile businessman, who seemed to put up a fight during his detention, has since his release in January said that he would be investing in some of Prince Mohammed’s pet projects. Prince Mohammed bolstered his image by vowing to return Saudi Arabia to an unidentified form of moderate Islam; forcing the country’s ultra-conservative religious establishment to endorse his reforms; suggesting that the kingdom may halt its massive global funding of Sunni Muslim ultra-conservatism to counter Iran’s revolutionary zeal; surrendering control of the Saudi-managed Great Mosque in Brussels; granting women the right to drive, join the military, and attend male sporting events; and creating a modern entertainment sector. Despite the boldness of his moves, Prince Mohammed has sent mixed messages about how far he is prepared to go. Women and men mix at concerts and theatre plays but are segregated in the three sport stadiums that have been declared open to women. While the crown prince has been decisive in his power and asset grab, he has yet to say a clear word about lifting Saudi Arabia’s system of male guardianship that gives male relatives control of their lives. Similarly, there is no indication that gender segregation in restaurants and other public places will be lifted. Asked about the guardianship, Prince Mohammed evaded specifics. “Today, Saudi women still have not received their full rights. There are rights stipulated in Islam that they still don't have. We have come a very long way and have a short way to go,” he said. 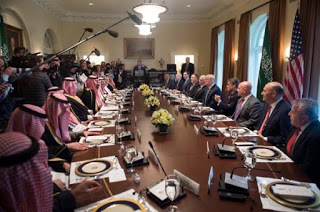 Middle East Scholar As’ad Abu Khalil, whose blog is named The Angry Arab News Service, posted a picture of Prince Salman’s meeting with Mr. Trump, noting that there was not one woman on either side of the conference table. Speaking Arabic despite having learnt to speak English by watching movies, Prince Mohammed appeared in his CBS interview to defend allowing a mingling of the sexes in the work place while shying away from ultra-conservative Islam's ban on a man meeting a woman unaccompanied by a male relative in non-professional or non-public settings. “We have extremists who forbid mixing between the two sexes and are unable to differentiate between a man and a woman alone together and their being together in a workplace,” Prince Mohammed said. No doubt, Prince Mohammed’s social reforms and promised economic change provide him significant arrows in his multimillion dollar public relations blitz. That is getting him the support of the White House. “Getting a strong presidential endorsement of the crown prince's trip to the U.S. to encourage investment in Saudi Arabia, that, I think, could be something that could be done,” said Anthony H. Cordesman, the Arleigh A. Burke chair in strategy at the Washington-based Center for Strategic and International Studies. Translating that into real policy and dollars and cent could, however, prove to be a harder sell.